MENLO PARK, Calif., Dec. 11, 2017 /PRNewswire/ -- For many workers, 2017 will end on an extra merry note. According to new research from global staffing firm Robert Half, more than half of senior managers surveyed (51%) said they expect year-end bonus levels to be at least somewhat higher than 2016. Just 10% of respondents reported bonus amounts will decrease, and 39% anticipate no change in bonuses. Separate Robert Half research found workers' performance only partly determines their bonus. In the survey, just 16% of human resources (HR) professionals reported bonuses are based solely on individual work, compared to 27% who said amounts are influenced by employee and company results. 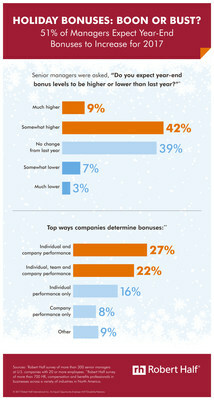 Another 22% said they factor individual, team and company success into bonus decisions. "Bonuses are a key recruiting and retention tool, especially with the intense competition for top performers," said Paul McDonald, senior executive director at Robert Half. "If budgets are tight, other ways to recognize exceptional work at the end of the year include gift cards, a department celebration or additional time off for the holidays." McDonald added, "To enhance their chances of securing in-demand candidates near year-end, particularly in today's hiring market, savvy companies are offering job seekers a sign-on bonus to offset a performance bonus they would have received from their existing employer." Tips for managers on handling year-end bonus discussions are on the Robert Half blog. The senior manager survey was developed by Robert Half and conducted by an independent research firm. It is based on telephone interviews with more than 300 senior managers at U.S. companies with 20 or more employees. The HR survey was also developed by Robert Half and is based on responses from more than 700 HR, compensation and benefits professionals in businesses across a variety of industries in North America. Founded in 1948, Robert Half is the world's first and largest specialized staffing firm. The company has more than 300 staffing locations worldwide and offers online job search services on its divisional websites, all of which can be accessed at roberthalf.com. For management and career advice, visit the Robert Half blog at roberthalf.com/blog.